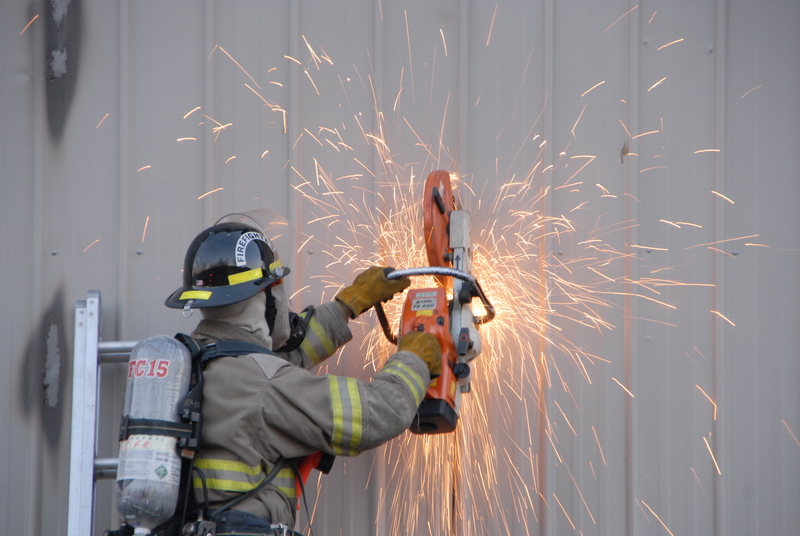 A firefighter from Edinburg Volunteer Fire Company uses a saw to cut open a wall for better access to the fire. CONICVILLE—A fire Saturday morning, Nov. 15, damaged a family business near Conicville. Nobody was injured in the blaze. Dispatch alerted fire and rescue crews to the fire at 6:12 a.m. When firefighters from Conicville Volunteer Fire Department arrived at 2328 Pepper Road, they found fire burning in a metal-clad garage-style building. They quickly entered the building and began fighting the fire, stopping its spread in the two-story interior. The building houses the Brillman Company, a family-run business that deals in electrical parts for automotive use. After extinguishing the fire, firefighters remained on the scene making sure that all smoldering hot spots had been found and dealt with. Units left the scene around 9 a.m. The cause of the fire is under investigation. Along with the Conicville Volunteer Fire Department, units also responded from Mount Jackson Rescue and Fire Department, Orkney Springs Fire and Rescue, Edinburg Volunteer Fire Company, Woodstock Fire Department, New Market Fire and Rescue Department, and Shenandoah County Department of Fire and Rescue. This entry was posted in Commercial structure fire, Structure fire and tagged Co. 10, Co. 12, Co. 13, Co. 15, Co. 18, Co. 21, Co. 23, fire, structure fire. Bookmark the permalink.